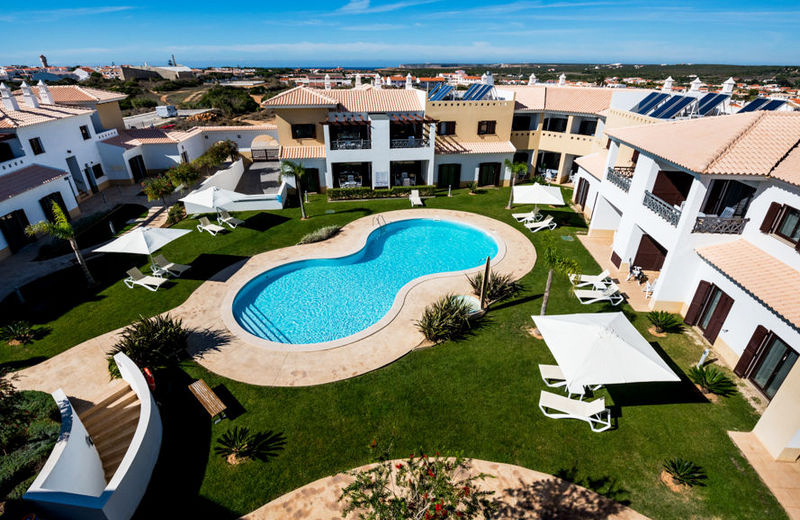 Odeceixe Yoga & Surf Villa - Aljezur, Algarve Guests overall rating: ★★★★★ 5 based on 3 reviews. The southwest coast of Portugal is a surfer’s paradise. The unbroken waves rolling in from the Atlantic are perfect for training ones/your surfing skills. The school is located on Odeceixe beach where classes are held. On the sand you will find a small beach hut where the classes start and where equipment can be rented. Lessons are two times per day, morning and afternoon, the instructors wait until the tide is in a better condition to go surfing. Our instructors are local surfers certified by the Portuguese Surfing Federation, all of whom have lifeguard licenses and a huge knowledge of the region’s beaches and its conditions. The camp lies hidden away in an untouched valley, surrounded by native, cork oak trees and our own organic vegetable gardens. A nearby river follows the valley and spills out to our local surfing beach. Our yoga and surf camp reflects our philosophy of ‘Simple Living’. Camp accommodation and facilities are simple with a rustic charm, yet tasteful and suitably comfortable. The inspiration for this one-of-a-kind apartment came from the original Portuguese name of the land, “Moinho das Canas”, which, freely translated, means Cane Mill. As the name suggests, a lot of cane grows here, and we used this material to decorate this apartment. The use of other natural building materials, such as cork, wood and stone, gives the apartment a truly harmonious feel. The living area contains a comfy, bespoke sofa, situated near a cosy wood-burner. A tiny oven built into the stove means that, on a cold day, you could even make a fire and cook a cake, should the mood take you. The windows to the front of the apartment grant an amazing view of the valley and access to a beautiful wooden decking area (more than 30m²), complete with outside shower and plenty of space for lounging, sitting, or doing yoga. For guests with children we can provide cots for the bedroom. Younger children can sleep on an extra bed in the living room or, if over seven years old, can use the low mezzanine level – a great adventure for kids (accessed via a small staircase). Alternatively, if old enough, we have a fully decorated yurt (Mongolian Tent) within sight of the apartment. As the name suggests, the Natural Elements apartment draws inspiration from the beauty of nature. The design of this wonderfully unique living space a wealth of natural materials. The bedroom design incorporates the famous cork oaks of Portugal, a beautiful mosaic and wood finishes, while the bathroom is styled on the stunning vistas of the desert complete with sand dunes created with Moroccan plastering techniques. The open-plan living room and kitchen area with also boast many natural elements, such a cork, stone and wood. The living area contains a comfy, bespoke sofa situated near a cosy wood-burner. A tiny oven built into the stove means that, on a cold day, you could even make a fire and cook a cake, should the mood take you. The windows to the front of the apartment grant an amazing view of the valley and access to a beautiful wooden decking area (more than 30m²), complete with outside shower and plenty of space for lounging, sitting, or doing yoga. On the other side we have a tiled outside area – for extra sun exposure in the morning and on windy days. Through this side you can also access your vehicle’s parking area, located just 30 meters away from the apartment, at the end of a wide, slate-paved path. Electricity, water and gas are included in the price; you will only pay for wood in the winter if you choose to make a fire. The building is centrally heated. For guests with children we can provide cots for the bedroom. Younger children can sleep on an extra bed in the living room or, if over seven years old, can use the low mezzanine level – a great adventure for kids (accessed via a small staircase). Alternatively, if they are old enough, we have a fully decorated yurt (Mongolian Tent) within sight of the apartment. For guests with children we can provide cots for the bedroom. Younger children can sleep on the couch or on an extra bed in the living room. Alternatively, if they are old enough, we have a fully decorated yurt (Mongolian Tent – see website for pictures) within sight of the apartment. Perfectly situated on a hill in a picturesque nature reserve, this large, ecologically-built house grants its occupants sensational views across the valley below – through which flows the famous Seixe river. The villa is specially designed and built with eco bricks, eco paint, and rammed-earth or taipa – an ancient, sustainable building technique. Together with the lake next to it, the great outside area and proximity to Odeceixe and its beach, it ensures the right ingredients for a great holiday or retreat. The building has a floor space of 230m2 and features one master bedroom with en suite (bath, toilet, sink), two smaller bedrooms, a bathroom (toilet, shower, sink, and wheelchair accessible if necessary), plus kitchen, living and dining areas. Each bedroom has its own outdoor access – great for doing yoga, reading a good book, or just relaxing in the hammock and taking in the ambience. The spacious kitchen comes equipped with a sink, utensils, oven, fridge/freezer and gas cooker, and will please any cook happy with its spacious feel – as will the herb garden in front of the house! Meanwhile, the open plan living and dining area measures a generous 80m2 and contains a large dining table with 10 seats, a big couch, and a TV with 80 satellite channels. Large windows throughout ensure that, even while relaxing indoors, guests can still appreciate the beauty of their natural surroundings. Furthermore, large glass sliding doors allow you access the large front decking area. For our more adventurous guests, we have two great yurts. Historically built to withstand the long winters of Mongolia, yurts have recently experienced a surge in popularity throughout the world. Humble-yet-luxurious, these durable dwellings hold particular appeal for those wanting comfortable and spacious accommodation – but with a low environmental impact. For those of you wanting to be close to nature, it doesn’t come much better than this; let the sounds of the great outdoors and the songs of nightingales lull you off to sleep and, in the morning, gently awaken to more wonderful birdsong. Truly, yurt living makes for an unforgettably relaxing night’s rest. Erected atop a wooden platform, a yurt consists of trestle-type walls, and a ceiling of wooden spokes which support the ‘crown’. This large central window not only lets sunlight in during the day, but also allows occupants to gaze up at the stars at night. Layers of canvas and felt protect against adverse weather and help stabilise the inside temperature. Both of our yurts contain 2 comfy single beds that combine into a double bed, a sofa, a dining table with two chairs, wood burner, light, electricity and an outside chill area. And, boasting inner dimensions of roughly 26m2, they’re surprisingly spacious! What’s more, each yurt is free-standing – so your only neighbours will be our three peaceful donkeys. For guests wishing to get the true ecological-living experience, a compost toilet is available for use. However, both yurts also have access to a shared bathroom (warm showers and flushing toilet) in the nearby ‘straw bale’ building. This eco structure, made from straw bales, clay and lime, also grants use of a well-equipped kitchen and a living room with internet. Furthermore, an outside seating area features a grill and a herbal section. All of these facilities are free for our guests to use as they please. Not only are the yurts ecological, but also economical. If you’re happy to forgo a few mod cons and live a little closer to our splendid natural surroundings, this is the accommodation for you! Cosy rooms in an eco friendly building to enjoy peace and nature. 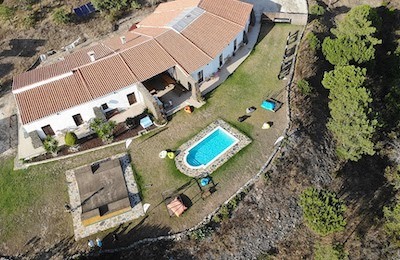 The Villa turns into a guesthouse format in low and mid season. This means you can rent each bedroom individually and the common areas, such as kitchen, living room and outside area become shared facilities. We offer 1 bedroom with en-suite bathroom and 2 smaller bedrooms that share 1 bathroom. Each bedroom has its own outdoor access great for doing yoga, reading a good book, or just relaxing in the hammock and taking in the ambience. Our passion first and foremost is surfing! Drawing on more than 25 years of surfing experience at world-class breaks all over the globe, we at The Valley take great pleasure in passing on that surfing stoke to beginners and intermediate surfers alike. We contract a local, fully licensed and insured Portuguese surf school to conduct our surf and yoga educational programs. 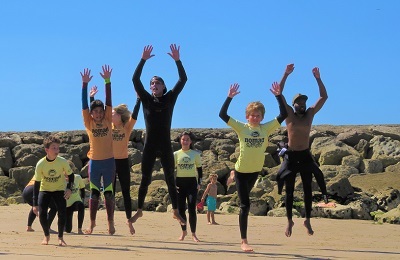 Our longstanding partnership with the Surf School ensures group sizes are kept to a minimum. An excellent range of beginners’ longboards as well as shortboards are available which are ideal and safe for surfers of all levels. You are free to sample our full range of surfing gear, picking and choosing boards as your surfing progresses and according to your comfort level. At all times we do our best to keep the number of guests to instructor ratio as low as possible to ensure that each guest receives the maximum personal attention. Surf school owners David and Cindy and their team of instructors will not only make sure your surfing progresses but more importantly that you have fun learning to surf and taking your surfing to the next level. The week will start with an introduction to the ocean on the first day. Our instructors will explain about safety and give you a bit of surfing theory. It is here we begin to develop a relationship with the ocean and our instructor; it’s also an opportunity for the instructor to assess each guest’s surfing level. Surf lessons are held each morning at one of the three beaches near The Valley. You’ll be picked up from the camp by the surf school. Conditions change daily so we aim to find the beach with the best conditions for you. Daily lessons of 1.5 hour will be held close to shore mostly, in water no more than waist deep and close to life guarded areas during the swimming season. 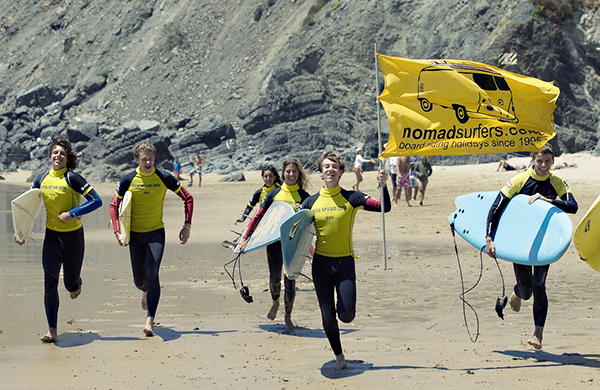 You’ll surf as a group in a designated flagged area set up by the instructor each day, to maximise group safety. After a nice picnic lunch in the afternoon, you are encouraged to free surf with your fellow guests and practise and expand on all you’ve learned in the morning class. Odeceixe beach has many waves on the ocean side, perfect for surfers and body boarders. This peaceful beach smells of rock roses. The top of the stone stairs is a perfect spot to watch the sunset and the landscape. The river Ceixe in the middle of the sand sets the border between the Alentejo and the Algarve. Experience inner and outer peace through yoga. Rediscover your flexibility, strength and purpose flowing with the beauty in nature. Reawaken the subtle sensations in the body. Join us for a great yoga and surf holiday retreat. Practising yoga and learning to focus and balance will not only help your surfing. It will also increase your flexibility and strength. An example: sun salutations in yoga help you to get to your feet on your surfboard as the movement is similar to popping up in surfing. But yoga is not just about asanas (steady postures, both still and moving with the breath). It is also a metaphor for life. Yoga at The Valley is always a very special experience, particularly as there is almost no noise, no distractions. The yoga we practise is based on traditional Hatha yoga. Our instructors teach a variety of different styles to suit our surf and yoga program. In the morning there will be subtle stretching and movements to complement the day’s activities, helping you feel awakened, and uplifted, particularly from the slightly more dynamic Vinyasa flow. In the afternoon there’s a softer, restorative class that will leave you feeling rested and content at the end of each day. Our yoga platform overlooks the camp and the valley and is a beautiful space to begin and end your day. Specially designed to accommodate small groups, it ensures that you as our guest have an intimate and a very personalised yoga experience and can fully take advantage of this unique opportunity to reconnect with yourself. When conditions are suitable, we take our yoga mats to one of the local beaches to experience yoga in the fresh sea air. Yoga on the beach is always a delight and gives you a real sense of freedom. We hope you find inner and outer peace at The Valley. The Valley is ideally situated to make the most of this beautiful natural region and is the perfect getaway for outdoor activities and a lifestyle of wellness. Our surf and yoga programs can be beautifully complemented by some of the activities and services of our outsourced contractors. As listed below. Revitalise, relax and reconnect by immersing yourself in nature! After a day well spent surfing and practising yoga, there is no better way to relax the body and mind than by having a massage within the tranquil setting of the retreat. There are several kinds of massages to choose from; they can be deeply soothing and revitalising or remedial and deep tissue or acupressure to release toxins. Our practitioners are fully licensed professionals and can also help in sports therapy if required. Massages start at € 35 per half an hour and € 50 to € 60 per hour and can be booked through us. The possibilities of hiking from the surf and yoga camp and around our property are endless! Trails that run along the cliffs on the coast, gentle walks along the river, beach strolls or more strenuous climbs of the local ridges and hills offer an incredible hiking experience in the Algarve, Portugal. Whilst at present we don’t have our own horses, a stable holding five horses is only a five minute drive away. The stable can arrange two-hour beach rides, gentle trots through eucalyptus forests, or fast cantering through the plains. The Valley is ideally situated to combine access to amenities, towns, tourist sites and airports, yet maintaining the peace, quiet and tranquility of a secluded retreat in Portugal. Not to forget, access to without doubt, some of the most beautiful untouched beaches in Europe! Positioned minutes from the Atlantic Ocean, our eco retreat has close access to bothAmoreira Beach and river andMonte Clerigo. The picturesque and quintessentially Portuguese village of Aljezur is just 2 km away. Faro International Airport is 1 hour 15 minutes away along a sealed motorway. The historical tourist town of Lagos is just 20 minutes by car. Lisbon is aprox 3 hrs to the north. The rugged and uncrowded western Algarve offers stunning scenery, bird life and nature walks. Aljezur also boasts quaint seafood restaurants and of course fantastic coffee and cake shops. The closest international airports to Aljezur are Faro (1h15min drive) and then Lisboa (approx. 3h drive). Faro is closer, smaller and more relaxed and has an excellent new motorway for drivers. Lisbon whilst further away has the advantage of 2 daily buses passing directly through Aljezur, our local village. Faro Odeceixe is about 124 km and takes about one and a half hour drive. From Faro you follow the highway A22 in the direction of Portimao (untill the end). Afterwards you continue on the public road to Aljezur. In 20 minutes you’ll arrive in Odeceixe. You drive from Lisbon airport south to the A2 Sul highway in direction Grandola. After that you follow Sines. From Sines direction Odemira. Before Odemira you go in the direction of Lagos. You’ll pass Sao Teotonio and after 11 km you’ll arrive in Odeceixe. The journey is 228 km and takes approx. 2 hours and 45 minutes. The nearest village is Aljezur. –Pick up transfer from the bus stop in Aljezur on the Monday of arrival at 15:00 or 17:30 when travelling by taxi, shuttle bus or bus to Aljezur. –Pick up transfer from the Galp service station on the Monday of arrival at 15:10 or 17:40 when travelling by car to Aljezur. You can follow us to The Valley and we have a parking area where you can park your car. –Transfer to Aljezur on your departure day. In case you’ve booked a 5 day stay, we will bring you to Aljezur on Saturday at 15:00. When you’ve booked a 7 day stay we will bring you to Aljezur on Monday at 10:00. Request during your booking process, we can contact a very reliable local taxi driver, payment is made directly to him. A taxi can be shared with a maximum of 4 persons. – A shuttle bus from Faro airport to Lagos (from € 13 per person) and then a bus or taxi from Lagos to Aljezur. – Or a shuttle bus from Faro airport until Aljezur (from € 105). Shuttle Direct, Holiday Taxis, May Transfer and many other companies. Many car hire companies operate in the Algarve including: Luzcar, Rentcar4less, Opodo, Rhinocarhire and Rentalscars. Good deals starting from around € 20 per day. HOW TO GET TO ALJEZUR TOWN? – Take a bus or taxi from the airport until the bus or train station. – Take a bus from Faro to Lagos and change in Lagos to Aljezur. – OR take a train from Faro to Lagos; walk 10 minutes to the bus terminal and take a bus to Aljezur. – Take a subway from the airport until the bus station (Zoologico stop) and take a direct bus to Aljezur on Monday morning at 07:30am. – Or take a subway from the airport until the train station (Entrecampos stop) and then train to Lagos followed by bus or taxi to Aljezur. "It's our last day at this beautiful paradise near to some of the most amazing beaches. We loved it here and I enjoyed to have the time to join the yoga classes every morning, after watching the sunrise from our terrace. If you are looking for a place to relax and enjoy the beauty of the nature that's the place to go! We will definitely coming back. " "All the guys that run the place are really special. We've been three times and will be returning again in 2017." "Great place in all respects. We enjoyed our stay and hope to return someday!"